Yes! YOU can design a meditation room. "Meditate. Live purely. Be quiet. Do your work with mastery. Like the moon, come out from behind the clouds! Shine." YOU can create a meditation room. If I can do it...you can, too. I'm not an interior decorator or designer. So, please don't let this photo discourage you in any way. Yes, this is my current home space for meditation practices. You may be thinking (as some of our friends) that it's too elaborate or fancy to create by yourself. Since I'm offering assistance at this 360 site to help you design a meditation room, I figure that showing what mine actually looks like would be helpful. 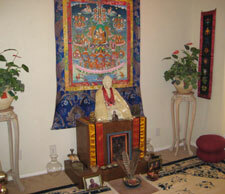 Just like learning to meditate, I'll help you get started simply to design a meditation room. You don't have to use an entire room of your home. Mine is adjacent to our master bedroom and the space is usually called a 'sitting room' (that's a funny pun, huh?) You may choose a small section of any room. The idea is that you're creating a sacred space in your home as a refuge and support for practice, no matter what meditation methods you use on or off your meditation pillow. STAGE 1: INTENTION to Design a Meditation Room. Now, when you begin to design a meditation room focus on the traffic to and from that chosen space. For example, let's say you have alot of room in a den. Yet, the den is used often with constant traffic near a noisy back door. This may not be the most auspicious space. You have to decide. What is your intention? Walk around your home and focus on which space or room would be appropriate. Be mindful of the lighting. Which direction would you face? (I'll explain that later on another page). Actually get your meditation pillow and sit there on the floor. How does that space feel? In my case the area I chose (remember the photo above) is convenient and private, even though I have to walk through my shrine room to get into the bedroom. Though this may not be the absolute best scenario (as I had in our prior home) it has worked nicely for many years. Seeing the beautiful space created really soothes my Soul. Before you rush into this project to design a meditation room, contemplate it for a while. Discuss it with your family, if applicable. Remember you are designating a sacred space in your environment which will affect its daily use. You're taking a courageous step in spiritual development by creating a powerful intention to 'change your mind' with beautiful energy-space in your home. This is a very beneficial activity to gain great merit. Your meditation corner or space will reflect a pure 'buddha nature' of mind, which is: bright as light, vast as space and open like the sky. Now you'll prepare the chosen space. If you are going to use a tiny corner of your bedroom then clear away any clutter and clean the area. A small table covered with your favorite fabric or large scarf is a nice way to start. Gather your special objects of veneration and place them accordingly. Keep it simple. Sit on your meditation pillow. Bring your beautiful intention to the space and make it sacred. Crystals, other semi-precious stones, etc. Something special: a gift, heirloom, hand-made art, etc. If you have a larger space available like mine then consider painting first. Then think about lighting the sacred art that may hang on the walls. Be creative… and have fun. Remember, this is your sacred space to awaken Soul. Surround yourself with beauty and meaningful things. Use your intuition. Follow your heart. I have a zafu (traditional, round meditation pillow) for guest meditators always available, as well as sadhanas, (booklets of spiritual practices, meditations and mantras). 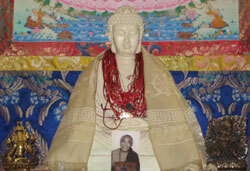 Creating a special sacred space for yourself is a wonderful support when learning to meditate. It's your intention to be in the present moment made manifest. Anyone can have a little space--anyone. Even if you have a tiny one-room apartment you can design a meditation room or a special space to enhance your practice. Good luck on your project to design a meditation room!